Saying Goodbye to Maker VISTA: Leadership Growth! After five inspiring and challenging years, we will be concluding the Maker VISTA program in Fall 2018. To celebrate the impact of this work, we’ve asked our amazing Maker VISTA members to reflect on their experiences and accomplishments this school year. Each of our VISTA members, working at various partner sites nationwide, came to this program with different perspectives, and focused on different projects—yet they all remain connected by a commitment to service and community. 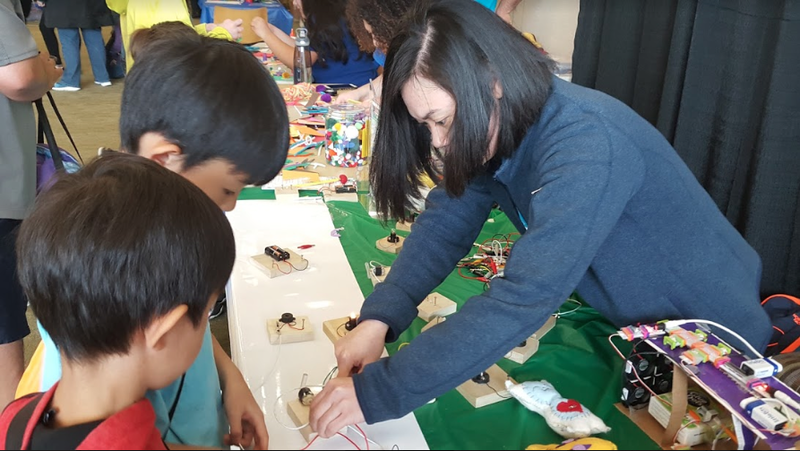 In this post, Alvin Hiedo, a VISTA member who recently completed his year serving at CSUSM STEM Center, shares more about how he, and the youth and educators he served, have been affected by maker-centered learning and capacity building. Making at our school’s sites via the incredible work of the STEM Ambassadors really succeeded this year. Throughout the past school year, CRESE (the Center for Research and Engagement in STEM Education) has continued partnering with 12 middle schools as part of the afterschool Mobile Making program, providing STEM learning to middle schools who would not otherwise have the resources to give students access to STEM learning. Middle school students were able to actively engage in STEM-related activities. These activities, designed by our team, focused specifically on providing middle school students experiences that would stimulate their interest and knowledge in multiple STEM subjects, as well as their creative abilities. One area where I experienced growth this past year was concentrated mainly around my leadership skills. I was part of a team of leaders who supported the STEM ambassadors and CSL students who went out to different middle schools to lead engaging STEM activities. One of my major tasks was managing the site visits and training schedules for 3 different school districts. I had to make sure our STEM Ambassadors were kept informed about the middle school site and day they were scheduled, along with making sure that CSL students received training on facilitating the STEM-related projects for the middle school students we supported. It was very important that both the STEM Ambassadors and CSL students knew where to go and what to do. I was responsible for making the schedule, communicating it with all of the members of our team, and maintaining and updating it as classroom/volunteers’ schedules shifted, all while making sure we had both STEM Ambassadors and CSL students making it to our sites timely and ready to lead. Of course, there were times when there would not be enough CSL students that signed up for a certain day at a middle school site. During some weeks, there wouldn’t be anyone signed up. Also, there were times when some CSL students could not make the scheduled trainings. In such moments, it became even more important that I continue to keep an eye on the schedule and encourage communication from our team about their capacities. There were times when I asked some of our CSL students if they could volunteer to move to days where no volunteers were scheduled to help make sure all of our middle school sites were covered. On a few occasions, I even filled in as one of our volunteers at a middle school to ensure that the STEM ambassadors had enough extra hands to help support them. I also was responsible for planning and providing make-up training sessions to ensure all of our CSL students were ready to go out to the middle schools. Holding myself accountable for team members experience, site attendance, and training has helped me experience and understand in a professional setting the various skills involved in team leadership, and having these experiences will help me professionally in the future. Every job looks for strong leadership skills, which I now feel confident that I have definitely improved on in the past year.